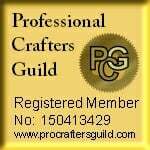 The Cross Stitch Guild is a wonderful resource for anyone who enjoys counted embroidery of all kinds. The Guild promotes education, innovation and preservation of hand and machine knitting and crochet. Dedicated to the promotion of hand knitting.